WELCOME. We hope your holiday will be the best ever. Look who's peeking in our window. We invite you in to our December page with various ways to celebrate the season. To copy off the art patterns, highlight and save to where you keep your photos. (On a Macintosh you can just slide them off on your desktop.) For the stories and poems copy and paste to your own word processor. On this page the print will be white so you will have to hi lite and turn the color to black after you copy it off. These are FREE. IF YOU DO USE ANY OF MY CURRICULUM. ALL WE IS THAT YOU LEAVE A COMMENT TELLING ME WHICH YOU USE AND HOW IT WORKED FOR YOU AND YOUR CLASSROOM. Written by Margaret C. Arvanitis Words and Music copywrite, 1988: BBBB, Inc. All rights Reserved. 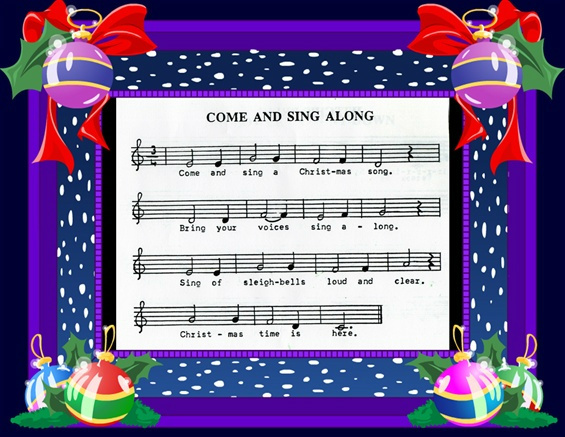 Come and sing a Christmas song. Bring your voices, sing along. Sing of sleighbells, loud and clear. Come and sing of mistletoe. Christmas trees with lights aglow. 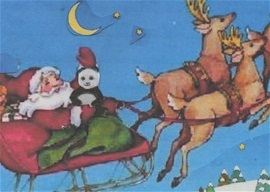 Sing of Santa coming near. Come and sing of love today. Of gifts that we will give away. Sing of a baby, sweet and dear. 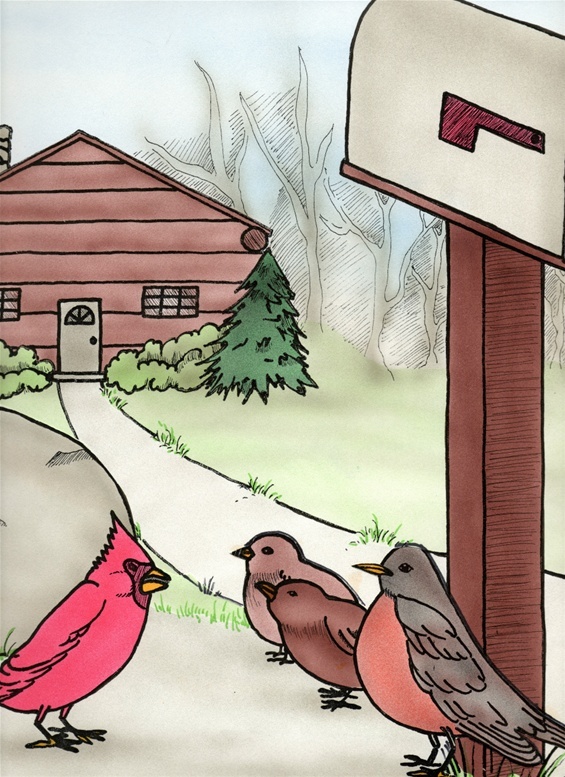 Reggie Cardinal watched the old man walk up the path from his house in the forest to the mailbox. The old man carried a bag in one hand and his cane in the other. With a happy smile, he stopped at the mailbox, pulled out a letter and shoved it into his pocket. 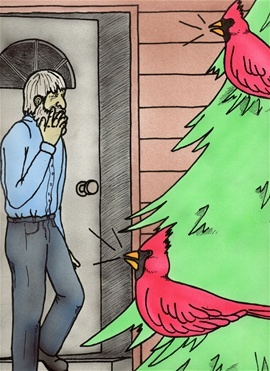 Reggie knew that the old man lived alone and waited all year for the letter that told him when his family would arrive for their Christmas visit. Reggie also knew that even on the coldest days of winter the old man brought food to the birds of the forest. When he heard the old man whistle for the birds to come for their treat, he joined the other birds on the ground. Bluejays grabbed the larger seeds and flew to the near by branches to enjoy their tidbit. Tiny brown juncos and yellow finches bravely flew among the bigger birds to get their share. We cannot,” said the juncos. We are too small to help a human person.” They flew away. We cannot,” said the jays. We are cold. 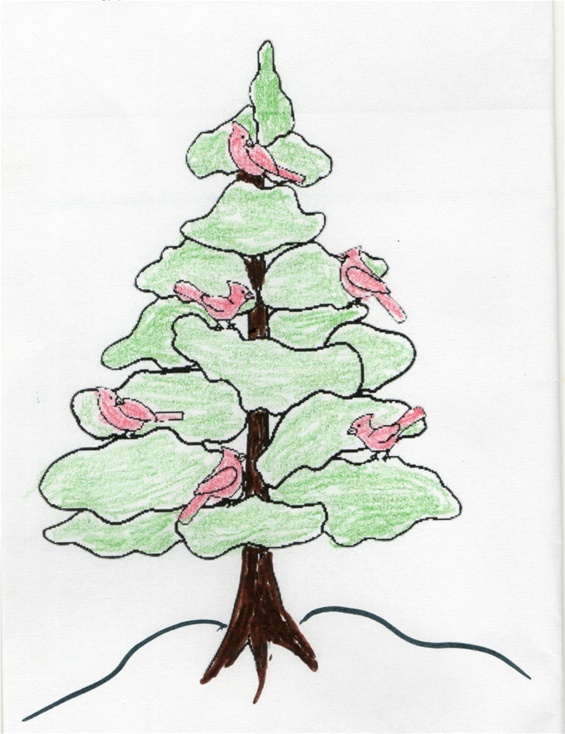 We must find a cedar tree with thick branches to protect us from the winter wind.” They flew away. “We cannot,” said the woodpeckers. “If the old man isn’t going to feed us we must spend our time looking for insects under the bark of the evergreen trees.” They too flew away. The red birds perched themselves upon the little fir tree by the cabin door. More cardinals appeared. 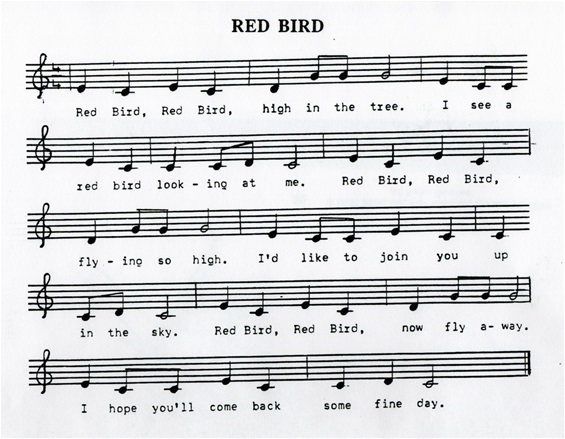 Soon red birds covered the tree from top to bottom singing their sweet song. When the old man heard them he came out of his house. He smiled for the first time since he received the letter. “Well now, I have been feeling so sorry for myself that I neglected my forest friends. But even when I don’t feed you, you cheer me up with your songs. We’ll have Christmas after all." He hung a wreath on the door and placed the candles in the windows. Next he brought out his fiddle and played all the Christmas songs he knew. A loud horn blast sounded above the music. A station wagon drove down the lane with waving children hanging out the window. When the car stopped his grandchildren tumbled out. Tears of joy came to the old man’s eyes. Reggie watched as the old man led his family into the cabin. He knew there would be no feast at the mailbox until they left but he didn’t care. He was glad to see the old man happy again. This story is free to copy off and use in your classroom but is copyrited to M. C. Arvanitis. So it can not be shared elsewhere in print or electrontically. There are hundreds of great picture books you can have in your classroom. I know you have your favorites. There are many new books written by talented writers and artists. 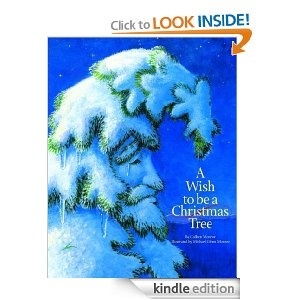 One of them is 'A Wish to be a Chrismas Tree' by Colleen Monroe.. Welcome your visitors into your room with this Hand Wreath placed on the door! Draw around students hands on green construction paper, cut out, glue on paper plate (or larger pizza holder is more hands that fit on a plate.) Add red bow on bottom. Write name on each child's hand print. The benefits of using play dough for young children brings to them a sense of smell, touch, and mixing of colors, and the play possibilities are endless! But it is expensive to buy, and the commercial play dough does not last long. So try making your own. If you have never tried making your own play dough, this is the time to give it a try. It’s very different to store bought play dough, being much softer and lasting a whole lot longer. 2 tablespoons vegetable oil or use baby oil for a nice scent. Have children take turns measuring and mixing the flour, salt, cream of tartar in a large mixing bowl. Add in the food coloring, oil and any flavoring into the boiling water. Mix well until all of the stickiness has gone. This is the most important part of the process, so keep at it until it’s the perfect consistency. If it remains a little sticky add a touch more flour until just right. For December, we added some peppermint extract and made batches of green, red and white. For Fall add cinnamon to the flour. For a other nice smells, use vanilla, or banana flavoring. This play dough can be used to make Christmas shaped cutouts which can be dried and and decorated for your classroom tree. Be sure you have enough cookie cutters and plastic knives for each child to enjoy. December is a perfect month to talk about time. Everyone is watching the calendar and counting down to the day Santa comes. Several ways to teach about the progress of time, aside from marking the calendar each day. Seconds: Snap fingers .. one snap for one second. Minutes: Using a minute timer let students see if they can stand still for a minute, without talking or moving. 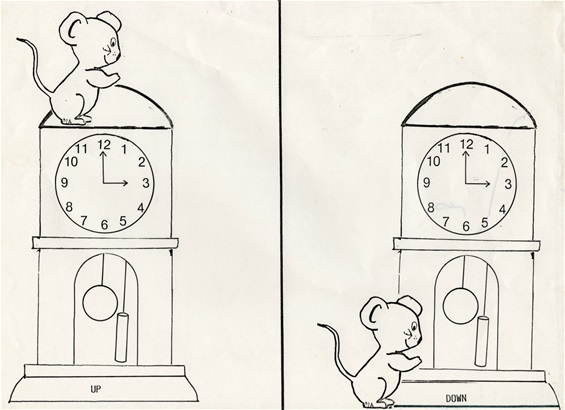 Hours: using a clock with movable hands, demonstrate the hour hands. 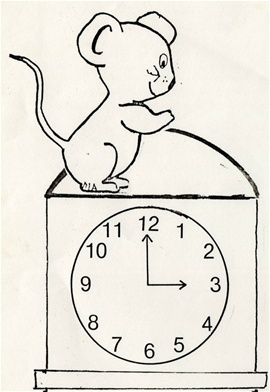 As you wind the hand let children count from one to 12, by watching the hour hand touch the hour mark. Do it again to explain that it takes 24 hours to make a day. 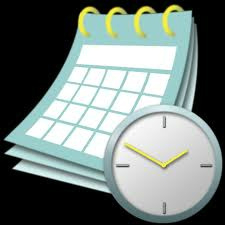 Weeks: Mark the days of the week on a calendar. Teach children the days of the week. Count the days and weeks until Christmas day. Months: Have each child make and decorate their own calendar for December. They cross out the days each morning they arrive for school. When teaching about time you can also add this color page to your discussion with your youngest students about placements. Up and Down. Color picture for December. Question to students? 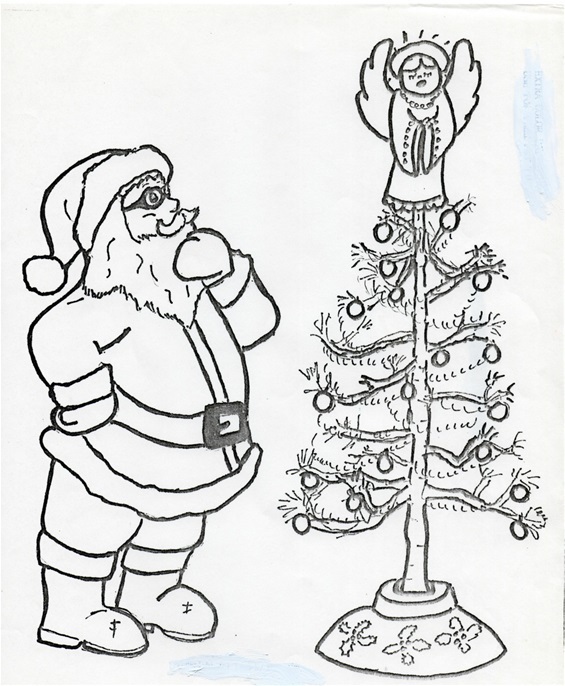 What is Santa Clause thinking about. Let students take turns telling what they think is happening in the picture. Write each child's statement down and read the story before handing out the picture. Happy song, easy to learn, Students will love it!